While some people might have unpleasant names for the kind of personal injury lawyer who takes on any and all cases, Kamran Yadidi is proof that not all attorneys are the same. He is the vehicle accident lawyer that cares about his cases and carefully chooses the ones that he defends. This commitment to both his work and clients have given him a solid reputation in the Los Angeles legal community that makes even big name insurance companies reconsider challenging him in front of a jury. When you choose Kamran Yadidi, you can rest easy knowing you have an attorney with far more experience than most other vehicle accident lawyers. His firm has a 98% success rate across 10,000 cases with over $200 million won on behalf of his clients. He has successfully defended clients who have been affected by a range of personal injuries including product defects, vehicle accidents, general negligence, and more. Having an attorney from the Kamran Yadidi Law Group means you get the absolute best vehicle accident lawyer fighting for you. Kamran Yadidi believes that money shouldn’t prevent you from receiving top tier legal support. Everyone, regardless of budget or societal status, has the right to quality legal representation. This is why Kamran Yadidi and his firm work with you on a contingency basis, which means you only pay if your case is won. Since its establishment in 1996, the Kamran Yadidi Law Group has become known as the top firm for vehicle accident lawyers in Los Angeles. The lawyers in the firm cover a variety of cases, from vehicle accidents to spinal injuries and more. 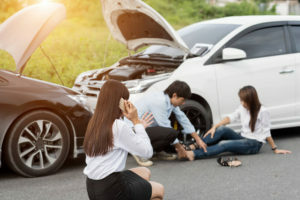 With a strong track record of success, the Kamran Yadidi Law Group has proven itself to be the firm you want on your side when looking for a vehicle accident lawyer in Los Angeles. The Kamran Yadidi Law Group is committed to our clients, which is why we work on a no recovery, no fee basis. This means that, unless we successfully secure a verdict or settlement for our clients, we receive no compensation. Since we are a large law firm, we have the ability to underwrite the cost of your lawsuit, even if that means going against a big insurance company. Contact us today for your free first-time consultation to see what we can do for you, or reach out via the phone number above.